On Saturday, I presented at the twentieth annual conference of the American Copy Editors Society, held in Portland, Oregon. My topic was “Copyediting and Corpus Linguistics”, and my aim was to give editors a crash course in using corpora to research usage questions. I was floored by the turnout—there were probably close to two hundred people in attendance. And I was surprised at how quickly the hour went by. I wish I’d skipped most of the background stuff and spent more time demonstrating how to do different kinds of queries and answering questions, but live and learn, I guess. I’ll have to remember that if I teach the topic again at future conferences. I’m posting a slightly expanded version of my presentation below. And if you attended and you still have questions, or if you weren’t able to make it, feel free to leave a comment here. I’ll do my best to answer. And, of course, a big thanks to ACES for hosting and to all those who attended. ACES folks are the best. Last week’s earthquake in northern Japan reminded me of an interesting pet peeve of a friend of mine: she hates the word temblor. Before she brought it to my attention, it had never really occurred to me to be bothered by it, but now I can’t help but notice it and be annoyed anytime there’s a news story about an earthquake. Her complaint is that it’s basically a made-up word that only journalists use, and it seems she’s essentially right. 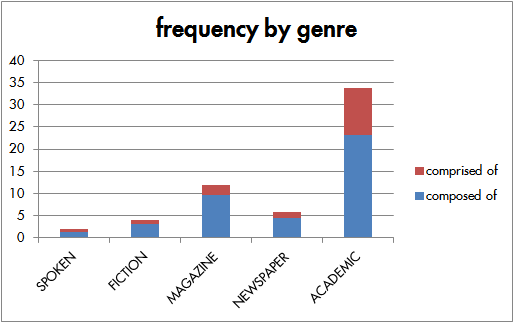 A quick search on Mark Davies’ Corpus of Contemporary American English shows that temblor occurs just over twice as often in newspaper writing as in magazine writing, and more than three times as frequently in newspaper writing as in fiction. It’s effectively nonexistent in academic writing—the only two hits in COCA are actually in Spanish contexts, as are three of the hits under fiction. It’s also worth noting that all of the spoken examples are from news programs. 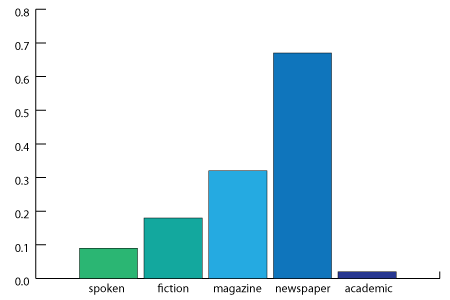 The following chart shows its frequency per million words. I don’t understand why the AP Stylebook needs to point out spelling and synonymy—I thought those were the jobs of dictionaries and thesauruses, respectively—but I find it interesting that it doesn’t list any other synonyms. Thesaurus.com lists convulsion, fault, macroseism, microseism, movement, quake, quaker, seimicity, seism, seismism, shake, shock, slip, temblor, trembler, undulation, and upheaval, though obviously not all of these are equally acceptable synonyms. So why does temblor get singled out? I honestly don’t know. I do know that journalists are fond of learning synonyms to avoid tiring out common words, and I know that at least some journalists take the practice to unreasonable levels, such as the teacher who made her students memorize 120 synonyms for said. Whatever the reason, journalists seem to have latched on to temblor, though few others outside the fields of newspaper and magazine writing have picked it up. A few days ago John McIntyre took a whack at the Associated Press Stylebook’s penchant for flat assertions, this time regarding the spelling of gray/grey. McIntyre noted that gray certainly is more common in American English but that grey is not a misspelling. But I don’t think Webster’s dictionary really proves that at all. When confronted with multiple spellings of a word, lexicographers must choose which one to include as the main entry in the dictionary. Webster’s choice of gray over grey may have been entirely arbitrary. Furthermore, considering that he was a crusader for spelling reform, I don’t think we can necessarily take the spellings in his dictionary as evidence of what was more common or standard in American English. So I headed over to Mark Davies’ Corpus of Historical American English to do a little research. I searched for both gray and grey as adjectives and came up with this. 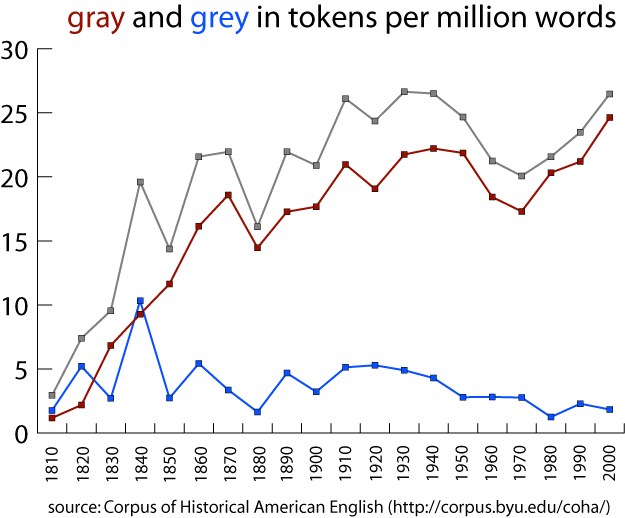 The grey line represents the total number of tokens per million words for both forms. 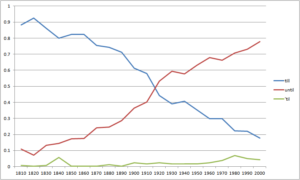 Up until about the 1840s, gray and grey were about neck and neck. After that, gray really takes off while grey languishes. 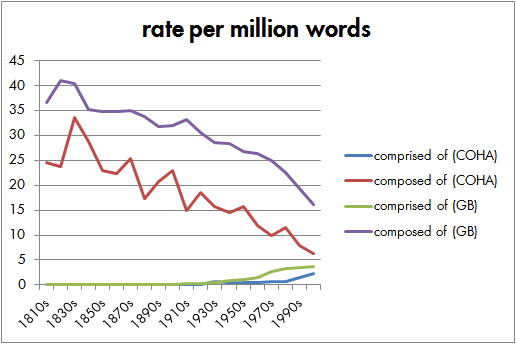 Now, I realize that this is a rather cursory survey of their historical distribution, and the earliest data in this corpus predates Webster’s dictionary by only a couple of decades. 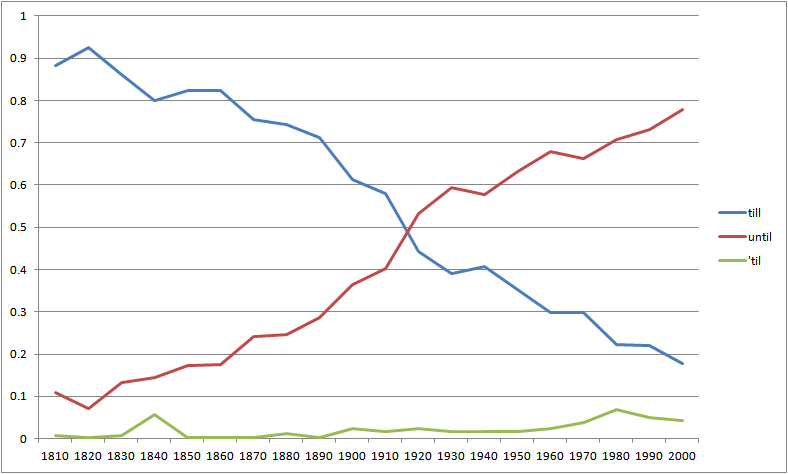 I don’t know how to explain the growth of gray/grey in the 1800s. But in spite of these problems, it appears that there are some very clear-cut trend lines—gray became overwhelmingly more common, but grey has severely diminished but not quite disappeared from American English. This ties in nicely with a point I’ve made before: descriptivism and prescriptivism are not entirely separable, and there is considerable interplay between the two. It may be that Webster really was describing the linguistic scene as he saw it, choosing gray because he felt that it was more common, or it may be that his choice of gray was arbitrary or influenced by his personal preferences. Either way, his decision to describe the word in a particular way apparently led to a prescriptive feedback loop: people chose to use the spelling gray because it was in the dictionary, reinforcing its position as the main entry in the dictionary and leading to its ascendancy over grey and eventually to the AP Stylebook‘s tweet about its preferred status. What may have started as a value-neutral decision by Webster about an utterly inconsequential issue of spelling variability has become an imperative to editors . . . about what is still an utterly inconsequential issue of spelling variability. Personally, I’ve always had a soft spot for grey. The other day at work I came across a strange construction: an author had used “not surprising” as a sentence adverb, as in “Not surprising, the data show that. . . .” I assumed it was simply an error, so I changed it to “not surprisingly” and went on. But then I saw the same construction again. And again. And then I saw a similar construction (“Quite possible, yada yada yada”) within a quotation within the article, at which point I really started to feel weirded out. I checked the source of the quote, and it turned out that it was actually a grammatically normal “Quite possibly” that the author of the article I was editing had accidentally changed (or intentionally fixed?). My suspicion was that the author was extending the pseudo-rule against the sentence adverb more importantly and was thus avoiding sentence adverbs more generally. I’m not quite sure what’s going on here. As I said above, the only explanation I can come up with is that someone has extended the rule against more importantly or perhaps other sentence adverbs like hopefully that don’t modify anything in the sentence. Not that the sentence adjective version modifies anything either, of course, but that’s a different issue. If anyone has any alternative explanation for or justification of this construction, I’d be interested to hear it. It still strikes me as a rather awkward bit of English.